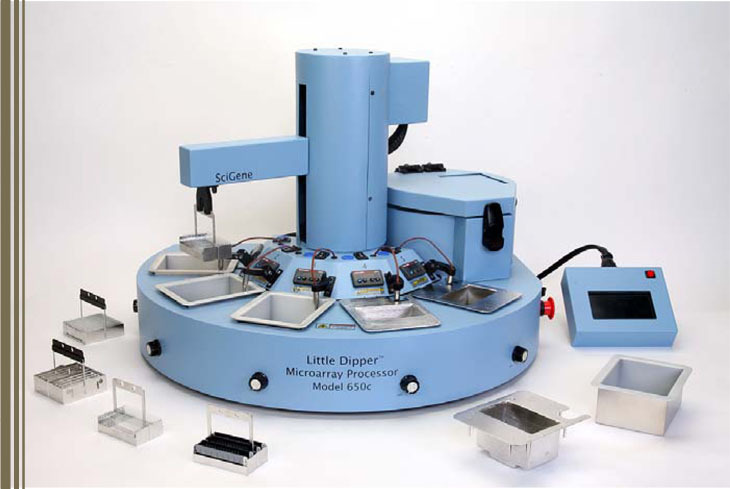 The SciGene Little Dipper Processor for Self-Spotted Arrays [Ord. #1080-50-2 (220V)] is a programmable robotic system that replaces the multistep, manual processes normally used for processing spotted DNA microarrays. Batches of 1 to 24 arrays are moved at programmed times between baths containing buffers in validated protocols. While submerged in each bath, arrays are washed using a combination of programmed up/down agitation and stir bar vortex mixing. For best results, the system is used within a NoZone Workspace to eliminate day-to-day assay variability caused by high ozone levels. The tight control of time, temperature, ozone levels and washing action assures superior array-to-array and batch-to-batch reproducibility. After filling baths and setting temperatures and stir bar rotation, arrays are loaded from cassettes into a 12 or 24 position rack then mounted onto the system's robotic arm. Alternatively, racks of arrays hybridized in the Hybex Microarray Incubation System can be loaded directly on the system without handling. After rack loading, the instrument takes over and performs all the processing steps including gentle drying in an integral centrifuge. The simplicity of the design makes training of new operators a snap. The Hybex Microarray Incubation System simplifies array hybridizations by eliminating cassettes and waterbaths. Coverslipped arrays are incubated in slide racks inside a humidified chamber placed in a small, heating unit. After incubation, racks are removed from the chamber and mounted directly on the Little Dipper for processing. The Hybex and Little Dipper Systems work together to streamline and tightly control the entire microarray sample incubation and array washing process for improved reliability of results. The Little Dipper Processor for Self Spotted Arrays is configured and programmed ready to use. The system arrives with all required components with validated protocols installed. Just follow the reference card and press start on the control screen. The instrument does the rest. The Little Dipper Processor can be easily configured for use with all commercial arrays and processing protocols, as well as FISH procedures. Use of a single piece of equipment for processing all microarray types simplifies operator training, avoids the added cost from duplicating equipment and saves bench space.